All sorts of good news from me today! All orders paid by noon today have now been shipped out. New orders for limited edition canvases will ship when I get back home November 8. All other ordering will be shipped as per usual, no delay! While I'm overseas, each day I'll be posting some of my ever-popular "penny auctions" on eBay - click here and bookmark - new auctions will pop up every day for ACEOs, limited editions, masterpiece editions & more! 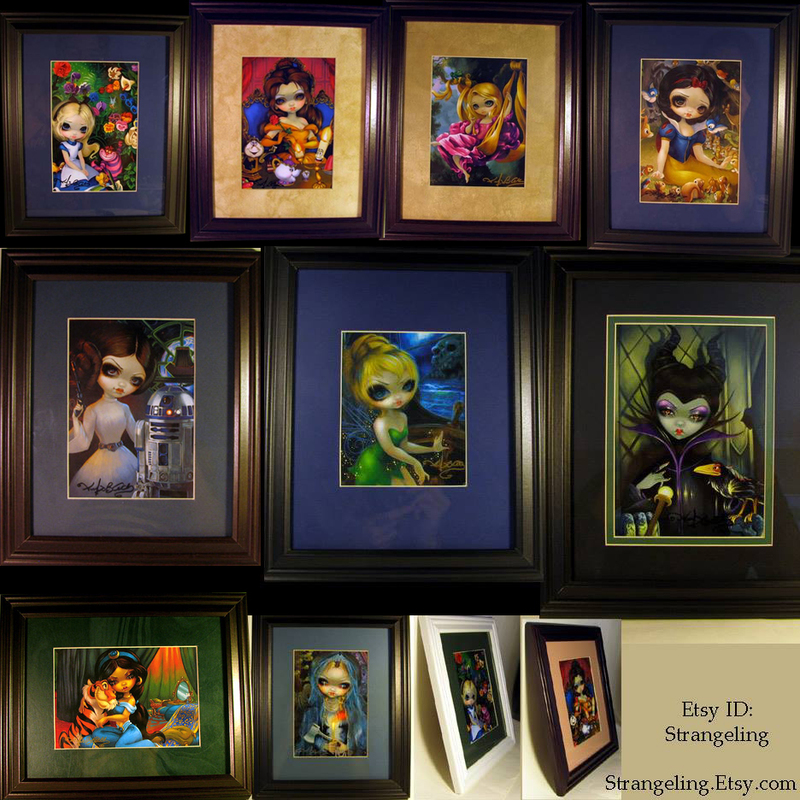 Fourthly - my sister Amber has framed a bunch of my pieces from Disney's WonderGround Gallery and had me autograph them - she has them up available for worldwide shipping on Etsy right here. These always sell fast, I apologize if some are already sold out. A great way to get some my Disney art souvenirs direct from the parks without having to fly on an airplane! Finally, I have several "last chance" limited edition canvas auctions up on eBay. These are for paintings that have already completely sold out of their limited editions, and these are the very last ones. I always auction off the "last" canvas of an edition so that if anybody missed out, they can still have a last chance bid. Each is hand embellished by me in acrylic paints, signed & numbered & dated & ready-to-hang. 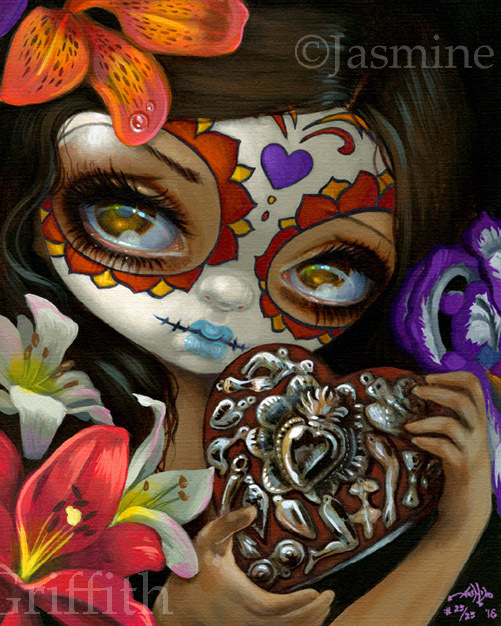 "Milagros: Corazon" #25/25 is here , "Pale Medusa" #25/25 is here , and the massive 16x20" Masterpiece Edition of "Unseelie Court: Envy" #5/5 (only five were ever made!) is here . 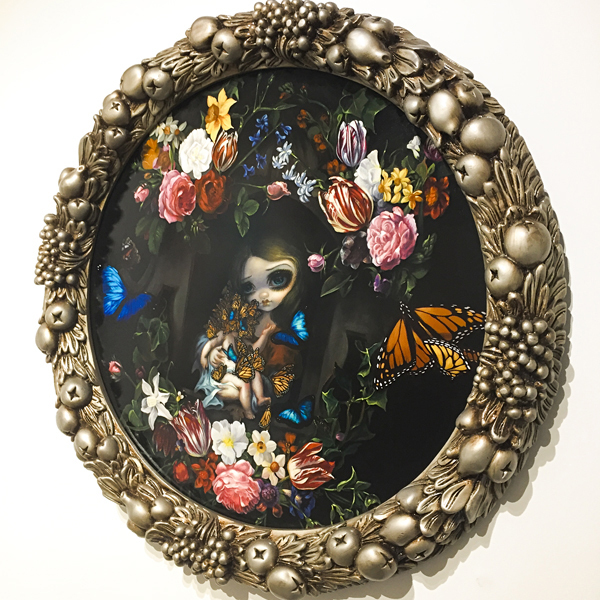 My darling giant painting for the Corey Helford Gallery - this original painting is available - "Étreinte de Papillons " here - $15,000 - 37" framed, original acrylic painting on a round panel, if you are interested simply email Jan at: jch@coreyhelfordgallery.com - or call (310) 287-2340 - they can ship worldwide and may be open to working with payment plans, etc. One of the largest paintings I have ever done, and certainly one of the most time consuming, this is one of my all time favourites. Étreinte de Papillons is a French name translating to "Embrace" or "Hug" of the Butterflies. Inspired by documentary films I've seen of butterfly swarms, monarchs & blue morphos in particular - when traveling/migrating they often all rest upon the eyes & faces of animals - to drink their tears when there is not a nearby source of water. Referencing 16th century paintings of "garlanded" portraits (often of madonna & child scenes, or prominent people, etc.) 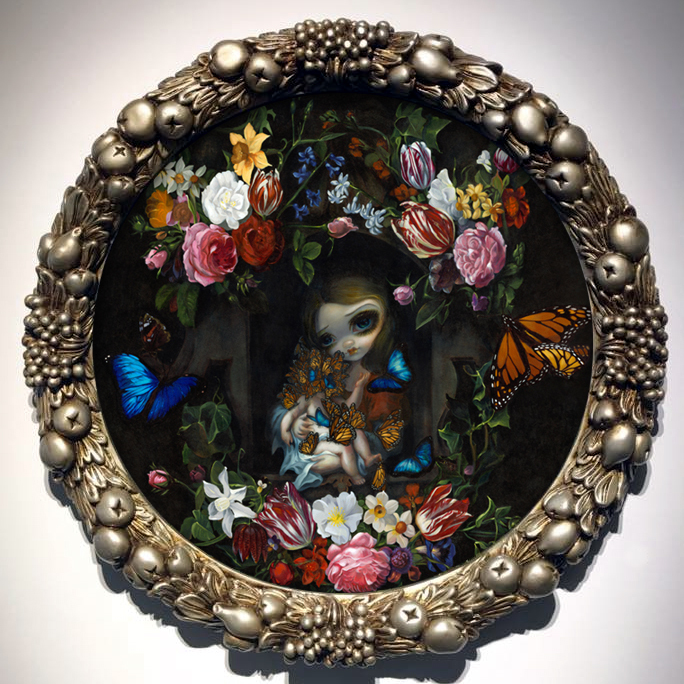 since it's part of the "Allusions" (references) category in my Allusions and Allegories show, there is a ton of classical flowers, leaves, insects, etc. 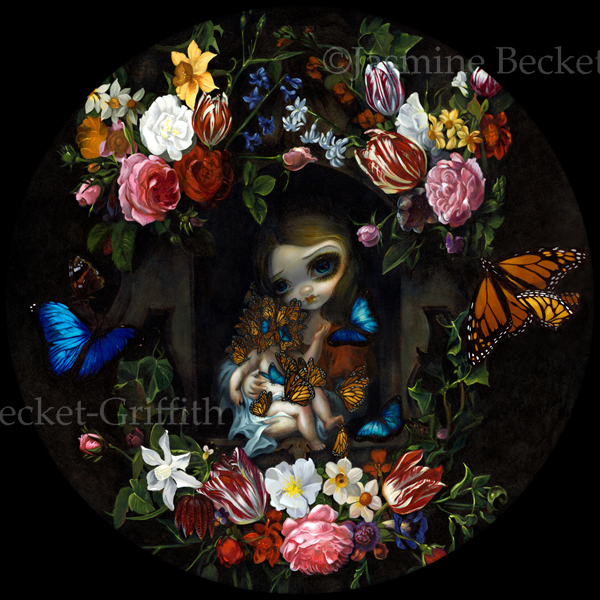 A portion of the proceeds from this painting will be donated to a charitable organization for Epidermolysis Bullosa - children born with Epidermolysis Bullosa are sometimes referred to as "Butterfly Children" or "Butterfly Babies." We have several types of prints available, on sale this week from $9.99. The glossy photo prints are signed on the back by me and come in two sizes, 8x8" and 12"x12" for ($9.99 - $19.99). Then we have the open edition remarqued canvas prints, on sale for only $90 - ready to hang, signed COA, 12x12". And finally we have the huge gorgeous 20x20" Masterpiece Limited Edition Canvas prints for $595, each one of those is hand embellished by me in acrylic paints, signed, numbered, only 5 of them are ever made, dated, gallery wrapped & ready to hang. All are available on my website here, worldwide shipping. Use the drop-down box to select your print option. Now in stock & shipping - my officially licensed figurine collection for "The Munsters" - turned out super cute! 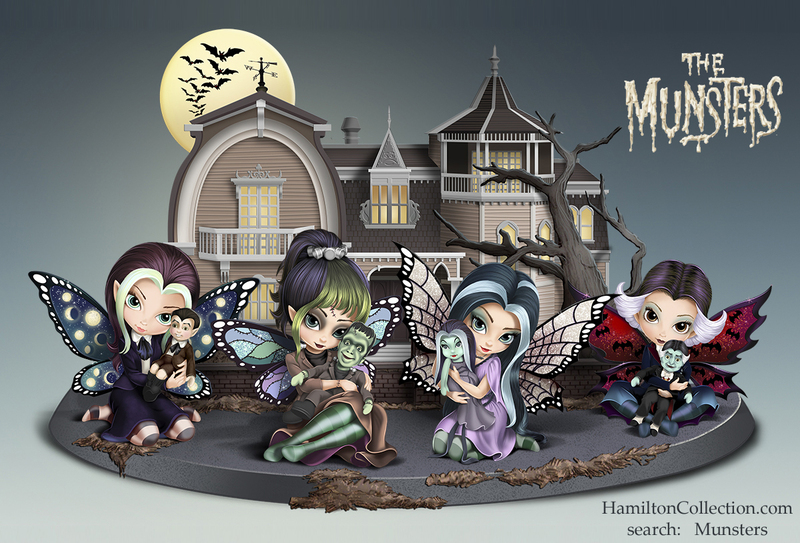 USA customers - these are up now at HamiltonCollection.com here- or just search: Munsters and you'll find them =) Item# 909014. They have already gone into production and express shipping is available. Don't live in the USA? Don't worry! They'll pop up soon at the international websites too, don't worry, I will let you know when they do =) Collection stars with Herman, and then you'll get Lily (my favourite!) and all the rest. Their house comes as one issue itself - perfect shelf for sitting them all on. Questions about ordering, shipping, etc.? Contact Hamilton Collection! When they're gone, they are gone! That's what a "limited" edition means, of course! I have several "last chance" limited edition canvas auctions up on eBay. These are for paintings that have already completely sold out of their limited editions, and these are the very last ones. I always auction off the "last" canvas of an edition so that if anybody missed out, they can still have a last chance bid. Each is hand embellished by me in acrylic paints, signed & numbered & dated & ready-to-hang. 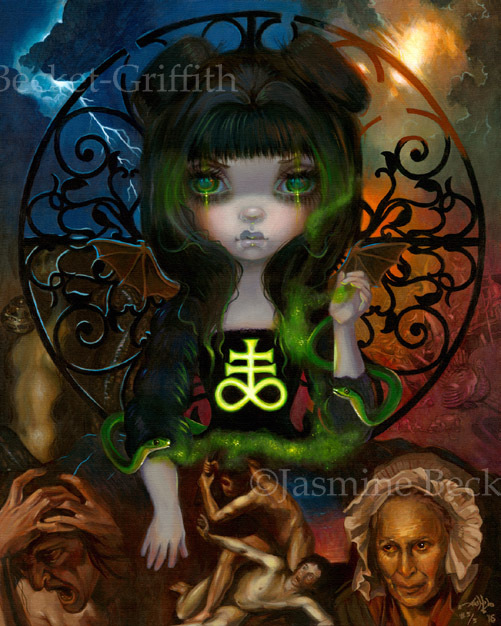 and the massive 16x20" Masterpiece Edition of "Unseelie Court: Envy" #5/5 (only five were ever made!) is here . Of course, you can still get the glossy paper prints & open editions up at Strangeling.com - those aren't going away any time soon. It's only the limited editions that are hand embellished by me that are now sold out for these three. My sister Amber has framed a bunch of my pieces from Disney's WonderGround Gallery and had me autograph them - she has them up available for worldwide shipping on Etsy right here. These always sell fast, I apologize if some are already sold out. A great way to get some my Disney art souvenirs direct from the parks without having to fly on an airplane!